As you might expect, there is no single answer, but there are myriad “quick fixes” which do more harm than good. In this post, we’ll show the way to enhancing user experience for your learners without resorting to design gimmickry. First, let’s look at why enhancing the user experience for your CME, CN, and CE learners is so important. According to recent research, along with the quality of educational content, the perception of the value received from CME programming impacts learner satisfaction, long-term user engagement, and knowledge retention. Since learning experiences that produce deeper user engagement tend to produce better knowledge retention, the user experience of your learners can have a direct impact on your CME program’s ability to meet your subscribers’ educational requirements. That’s because your learners will always think like customers. Their perception of value is highly dependent on if they feel that their ease-of-use needs are being served—how easily they can access your LMS and how rapidly those problems can be solved. Like diners at a popular restaurant, if your learners have to struggle to get what they want from your service, they might not want to brave the inconvenience a second time, even if they ended up satisfied. That means that your chances of fulfilling your mission statement—and being able to provide the ACCME with evidence of demonstrable positive results—are in many ways dependent on your ability to deliver the right content in the right way. As a CE, you’re naturally focused on developing innovative ways to create the most impactful educational experiences for your subscribers. User experience (UX) design is a discipline that web developers master in order to create uncluttered, task-driven websites. Learning experience (LX) design is specifically relevant to CME providers: it presents a framework for building educational projects—online and offline—that maximize user value and provider resources. An example of learning experience design would be the development of a website front end that highlights easy points of access to the tasks users most frequently search for. A login button, according to LX design principles, shouldn’t be dwarfed by an enormous “register here” button, and a searchable FAQ should be prominent after login. Activities should be easy to begin and learners shouldn’t have to hunt for updated information on their progress. Unless you’re using an LMS from a third-party, you’ll have a formidable challenge making sure that your website’s design doesn’t distract users from critical tasks, or intimidate by way of a steep learning curve. While finding the best way to manage support call volume is an inescapable component of every CE’s job, it doesn’t have to overwhelm. An effective self-service design can empower your learners to handle low-complexity issues on their own while helping you reduce their need for tech support. Recent studies have shown that consumers actually prefer to manage simple problems on their own, as long as the troubleshooting process is straight-forward and relatively quick. If you haven’t found a solid third-party LMS solution, you’ll have to create a knowledge base and self-service structure that is as user-friendly as it is comprehensive. Users should be able to find the information that they need without too much scrolling; make the FAQ user interface simple and easy to navigate. For more difficult questions, the knowledge base should offer information in tiers, according to complexity. For example, your FAQ should address “how to cancel an order” before presenting an in-depth explainer which addresses a much more complex problem, like how to identify a compromised user account and delete personal payment data. A shift towards self-service won’t compromise your member’s user experience. Instead, it allows them to evade unnecessary interactions with tech support (which often adds to the risk of further customer disappointment). Your learners expect a seamless CME experience including UX: in order to win their loyalty, you’ll have to match and exceed their requirements. That means making certain that the structure of your LMS is user-friendly and task-focused. Activities should be simple to access, progress monitoring should be effortless, and on-page help should be ever-present. Above all, activities design should conform to the most recent ACCME guidelines, in format as well as educational content. Your LMS should present learners with a clear picture of how each activity specifically addresses professional practice gaps. It should also provide a consistent, high-quality experience across every screen: users shouldn’t have to struggle to complete activities when accessing your site from a mobile device. Your users should never have to guess about the relevance of their activity to AMA PRA Category 1™ requirements. At every juncture along your learners’ CME journey, the educational value gained should be made explicit, and tethered to real-world imperatives—such as improved patient outcomes—that have been highlighted in the most recent ACCME and AMA PRA Category 1™ directives. Enhancing user experience for your CME learners is a challenge. Thankfully, its one that you don’t have to face alone. 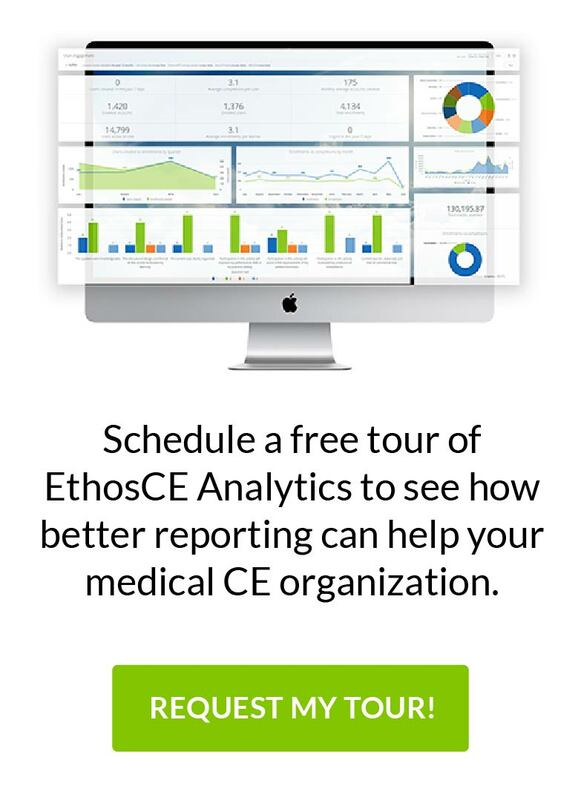 At Ethos CE, we’ve worked with associations like yours for more than 16 years, helping them provide their members with exceptional educational experiences. You can click here now to request a time to speak 1-on-1 with our CME technology experts to explore new ways you can simplify your ACCME accreditation submission process!